Autumn Mountain Road by Carolyn Almendarez. 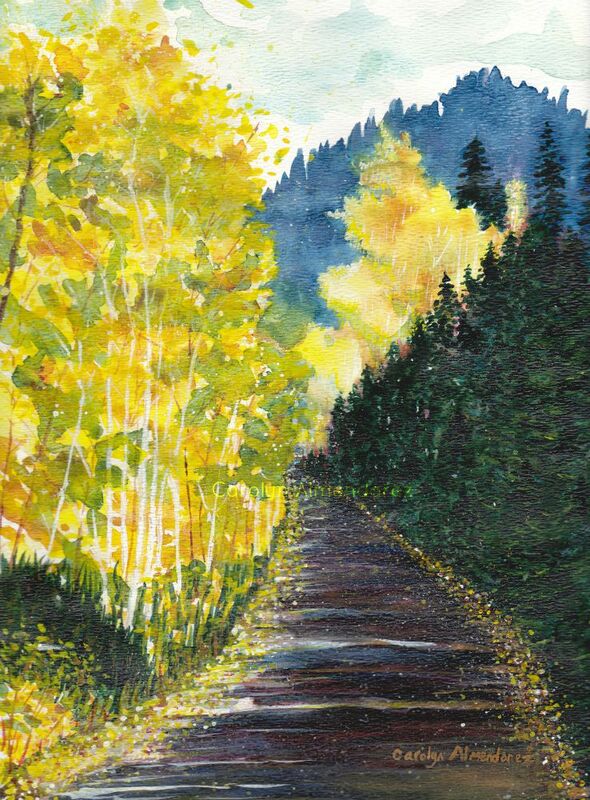 A watercolor painting of majestic pine trees and shimmering aspens in the cool mountain air of autumn. I love driving through the mountains during autumn. The air is cool and crisp. The changing leaves sparkle and shimmer falling to the ground like confetti at a parade. The stalwart pines stand majestically while the wind twirls the fallen leaves like young lovers at a dance. Each year nature gives her grand performance of setting the mountains ablaze with color before snuggling them softly under a blanket of snow. 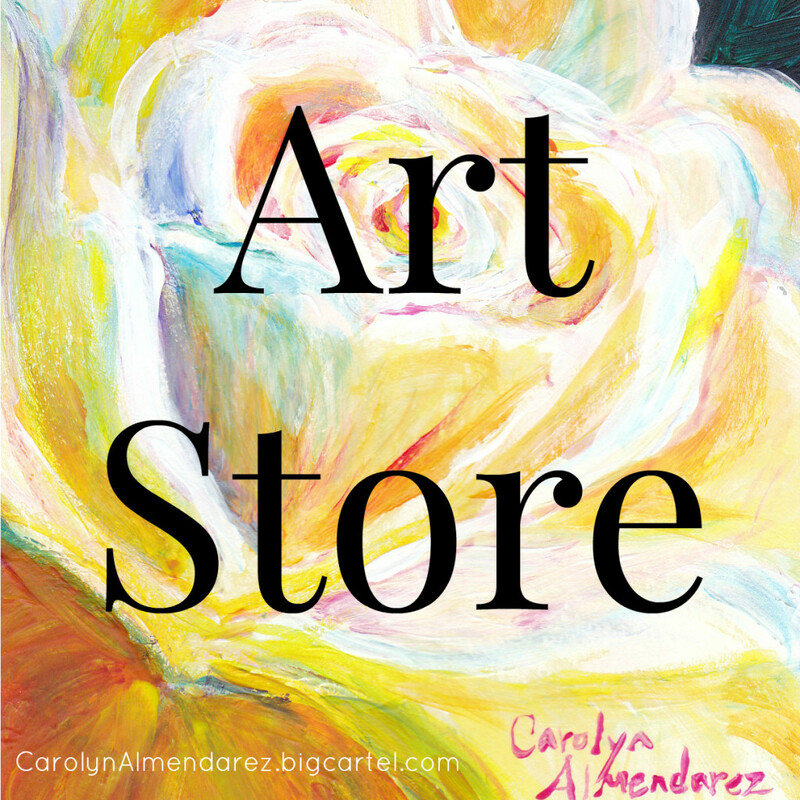 Carolyn Almendarez is a self-taught artist. She has a love for nature, beauty, and people. 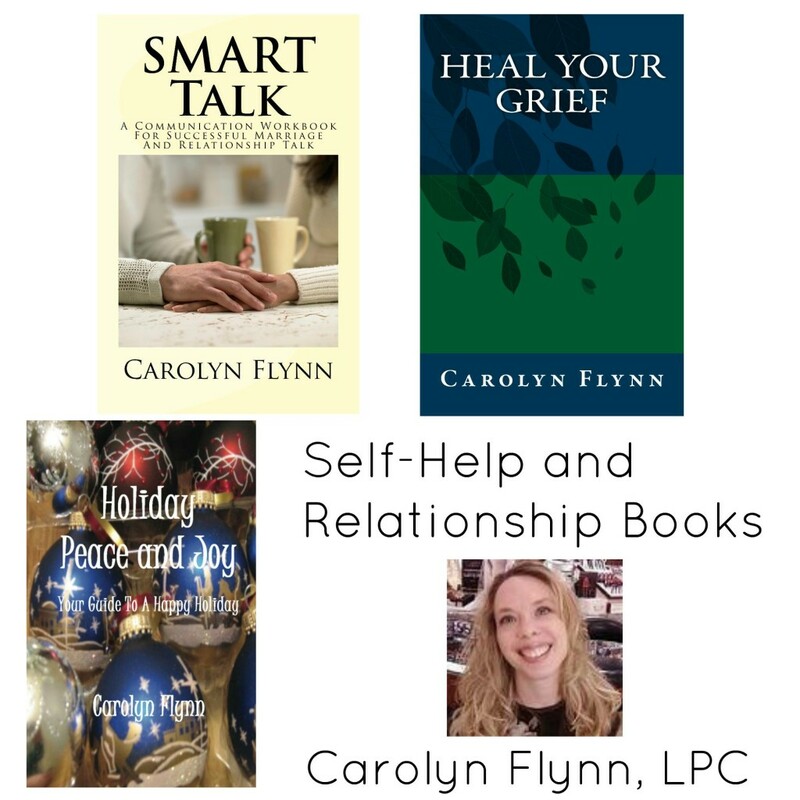 Her creativity expresses the love and joy she sees in the world. She enjoys the brilliant colors and fluidity of watercolor and acrylic painting, and has recently expanded her repertoire to include portraits of people and the expressions of life. 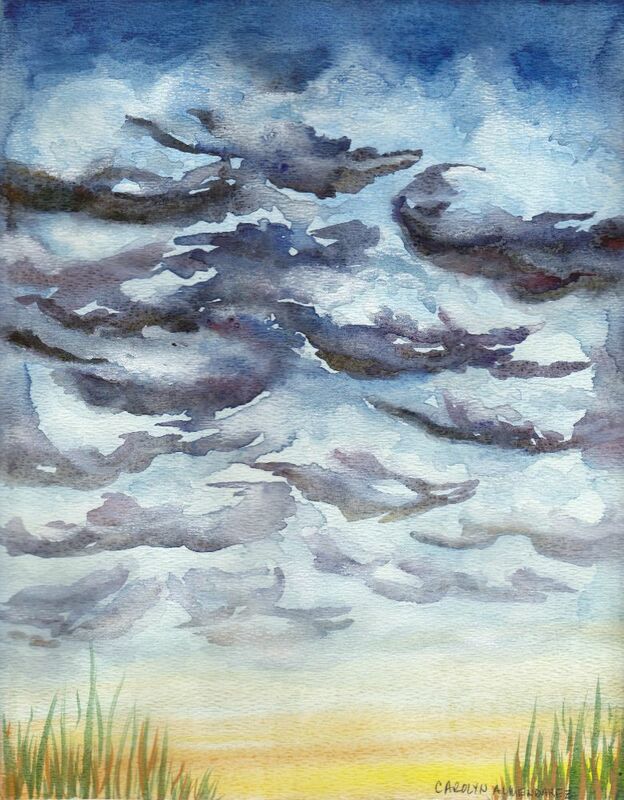 A watercolor painting of a stormy day at the beach. Clouds are tricky to paint. In real life clouds appear white, but to obtain the fluffy white formations in a painting requires multiple colors and depth of shadows to create the illusion of clouds in the sky. 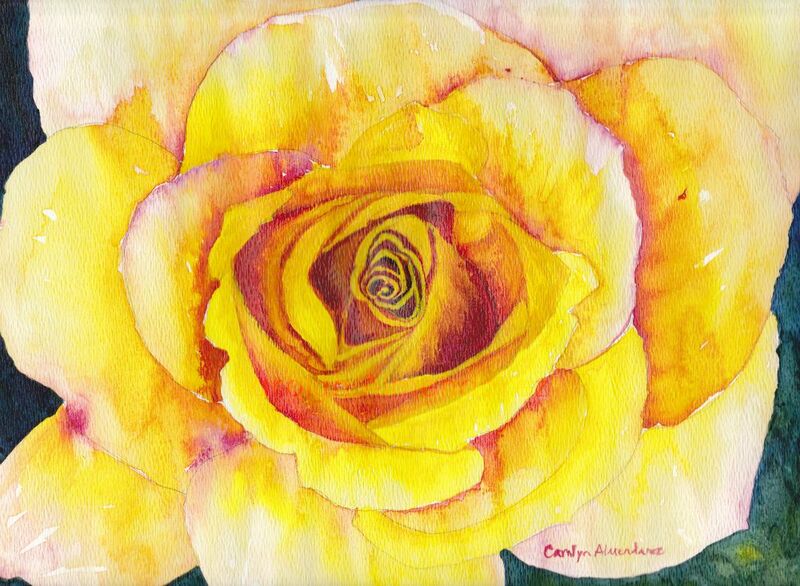 Yellow Rose Watercolor Painting by Carolyn Almendarez. A brilliant yellow rose with red accents exploding in bloom. The delicate petals of a soft rose in bloom blend perfectly with watercolor pigments. Here the intense reds of the rose’s yellow center softly fade to pale pink at the edges of a yellow rose in bloom. 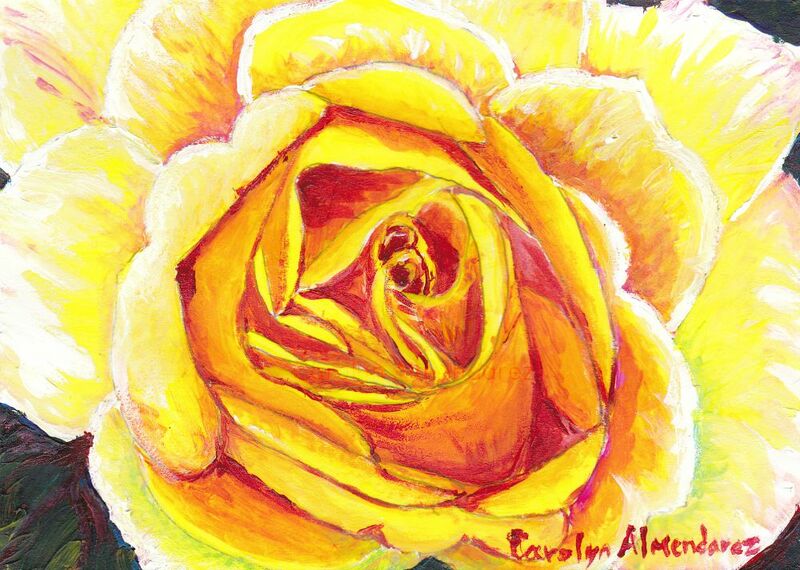 An acrylic painting of a yellow rose in bloom. A blossoming yellow rose captures the warm rays of sunshine in bold strokes of yellow, white, and red. 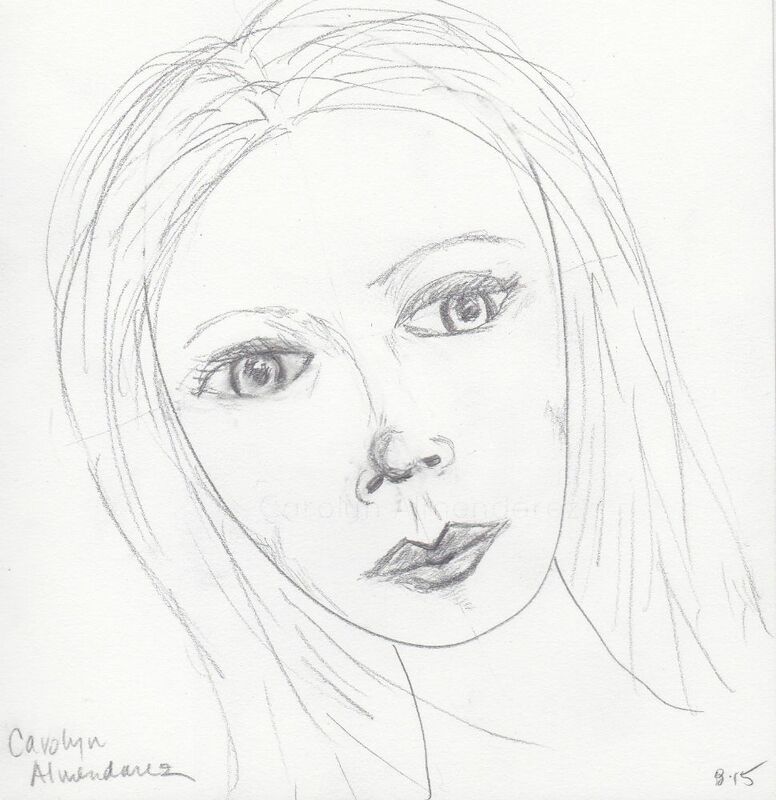 A pencil drawing of a woman’s face. I have started studying portrait drawing. This is my first attempt at basic facial features.